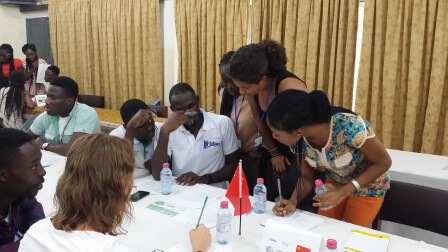 My second World Climate Simulation at the University of Cape Coast, Ghana, on the 16th September 2016, brought together exceptional environmental science students and researchers from the University of Cape Coast and visiting students from Norway, Sweden, and Denmark who were under Kultierstudier programme in the university. This allowed us to see how participants from the North and South can negotiate a global climate deal in a mock conference. 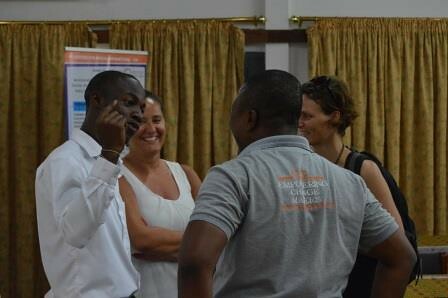 The event commenced with a brief introduction to climate change (covering science, impacts, and solutions) by myself and co-facilitated the event with Benson Adjei of Centre for Social Innovations and Dr. Laura Perreira. Benson Adjei, introduced the World Climate Simulation event to the audience and from facial expressions we could see a promising negotiations ahead of us. There were about 100 participants who were grouped into the 6 negotiating blocs while designating 10 people as Press Corps and 12 people under the Climate Activist bloc. Briefing notes were given to all blocs while the NDC proposal form was given to the 6 regions. We ensured that participants from Europe played the role of developing countries and those from Ghana played the role of developed countries. This helped them in better understanding the dynamics in other regions of the world. Laura, a visiting lecturer from South Africa, played the Executive Secretary of the UNFCCC. She gave a wonderful speech to open the first round of negotiations. 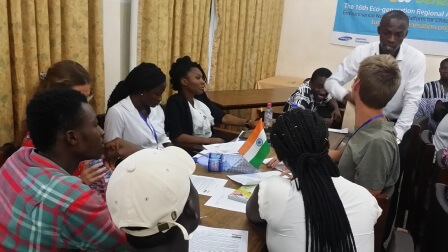 The 6 regions had about 15 minutes to read their briefings and make their commitments known to the mock conference through the proposal form. After submitting their NDCs, C-ROADS was launched and the submitted pledges were entered. Surprisingly, delegates from Other Developing countries exhibited high demand for funds (requesting for $70B per year) while also demonstrating a good willingness to act on climate (committing the maximum amount to stop deforestation). Other Developed countries also amazed us with their strong proposal of 8% fractional rate of decline per year while committing the maximum to stopping deforestation and promoting afforestation. On this note, second round of negotiations began and the first bloc to make a move was the Climate Activists. They advised, as well as put pressure on, China, EU, and US to increase their financial contributions while limiting their CO2 emissions growth. EU and the Other developed nations seemed to have gotten along very easily as they both exerted pressure on Other Developing countries, China & India to increase their afforestation from 0.2, 0.6, and 0.7 respectively, to 1. Following that, there was a sudden fierce argument over the EU bloc. Notes from the press corps indicated that EU was only willing to contribute significantly to the Green Climate Fund if China committed above 20% of the targeted fund and if US contributed up to 50% to the fund. Successfully, there was peaceful negotiations between the Other Developed countries and the US. Additionally, India and Other developing countries formed a union of friendship. They presented a joint proposal to the US and China. China agreed to the proposal and gave $20b to GCF. EU also agreed to their proposal and acknowledged their responsibility contributing $30b to the fund and a 5% fractional rate of decline while starting their decline in 2060 instead of their previous commitment of 2080. However, activists spoke against that and the EU decided to stop emission growth at 2030 and started to decline in 2035. India seemed very ambitious and the US was willing to give money rather than reducing their emissions. After about 50 minutes, all the countries submitted their terms and commitments. It was really difficult to put an end to the negotiations as many delegates were still engaging their colleagues in other terms and deals. It was really amazing to see the reaction of some of our participants from Europe who were representing India and other developing countries. After feeding the second set of pledges into C-ROADS, we reached 2.4degC. Natasha Verco and I reiterated the impact of global warming and why it is necessary to stay below 2degC. With that, delegates from Other Developed nations and those from Other Developing countries swiftly opted to strengthen their commitment. They both increased their fractional decline rate to 10% per year and also decided to stop their emission growth at 2030 while they both committed fully to REDD and afforestation. After these changes, our global warming decreased to 2.2degC. The room was full of suspension as everyone looked up to US to make a change. However, delegates from India and Other Developing Countries united to put up a proposal to China. They proposed that China increase their fractional rate of decline to 12% and US to move their REDD and afforestation effort to 1. US agreed to that but China only agreed to 10% instead of 12%. Like magic, we reached 2degC with these changes. The house gave marvelous applaud to delegates who pushed for the changes that made it possible for us to achieve our target.